The central bank in Bangkok has turned less gloomy about short-term prospects. But before the new army government takes credit for avoiding a near-certain recession, it needs to worry about the huge credit buildup. Deleveraging in an ageing society could become a permanent drag. Anti-government protesters wave flags near the stadium where pro-government red shirts are gathering in Bangkok November 30, 2013. 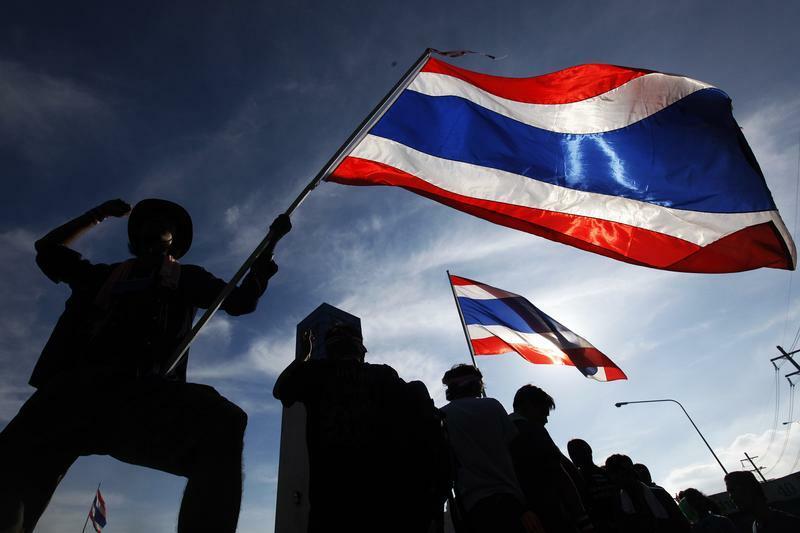 Thailand’s manufacturing and private-sector spending had “started to show signs of recovery,” Bank of Thailand said in its June 30 assessment of economic and monetary conditions in May, the month in which General Prayuth Chan-ocha, the army chief, seized control of the government. The central bank, which earlier this month slashed its 2014 growth forecast by nearly half to 1.5 percent, said GDP will grow more than 1 percent between April and June compared to the previous three months. That means the economy will not suffer a second consecutive quarterly contraction.